South African businesses, like millions worldwide, are embracing digital technologies with fervour. They bring seemingly endless opportunities to streamline workflows, increase productivity, enhance customer interactions, improve agility and increase competitiveness. However, adopting cloud, big data, mobile and social technologies haphazardly comes with risks. "Most things come together with a plan. 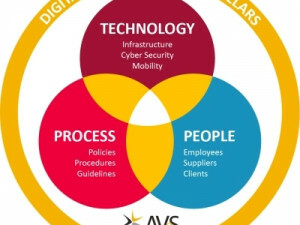 Digital transformation is the same," says Charl Ueckermann, CEO at AVeS Cyber Security. "The haphazard deployment of digital technologies does not achieve digital transformation. It also puts company networks, data, reputation and business continuity at risk. Yet, many companies are allowing technology to drive digital transformation across the enterprise when it should be strategy that drives it. "Companies need to prioritise the handling of digital transformation trends based on their fit with their overall business strategy and to avoid associated risks. It is very difficult to handle all trends and apply them to all business units at once. That is why a digital transformation roadmap is crucial to successfully leverage technologies as well as manage risks," says Ueckermann. The four megatrends impacting businesses - positively for those who have leveraged them well and negatively for those who haven't - are cloud computing, mobile technologies, social technologies and big data. Studies, such as the 537 Harvard Business Review, show that simply hopping on the bandwagon to implement emerging technologies will not boost business outcomes.1 Instead, real and meaningful benefits are achieved by companies that implement the most appropriate technologies to transform their core business capabilities. "Companies that know what core business capabilities they want to bolster with digital technologies and have a clear strategy for achieving digital transformation are more likely to get where they want to be, whether it's empowering employee mobility, improving customer insights, streamlining business processes or increasing revenues," Ueckermann stresses. Each business will have different transformational objectives so he says that defining the digital transformation goals is an essential first step. These goals should obviously align with the business's overall objectives and will inform the roadmap for digital transformation, from identifying which trend will be targeted first and choosing the most appropriate enabling technologies to the phases of implementation in each area of the business. With empowering employee productivity and mobility a priority for most businesses, mobile initiatives are the most frequently adopted of the four megatrends and have already transformed business operations and changed the way people work. Efforts in this area include equipping employees with smartphones and tablets and developing mobile applications for customers, employees and partners to use. Ueckermann says that companies need to become the masters of how they will deploy, manage and continually evolve their digital services to achieve true transformation; hypothetically from the point of deciding that allowing employees to use mobile devices for work, to the point of making infrastructural and security provisions to manage a bring-your-own-device (BYOD) environment. "Things can go horribly wrong though if it's not strategic," he warns. "There are some warning signs that a business is in need of a proper roadmap to target digital transformation trends. For instance, a disgruntled employee has left the company and you've got no way of recovering the business information on his personal laptop. Or, there's been a malware outbreak on a couple of computers because there has been no control or rules around the use of third party applications or cloud storage services. "If you are seeing these symptoms then it is time for a proper roadmap that will help to ensure that your digital transformation ambitions don't jeopardise the business."